You are currently browsing the tag archive for the ‘Europe’ tag. Hidden among the stories of the past few months, the crisis in Iraq, conflict in Ukraine and the Ebola outbreak in West Africa, there have been the occasional underplayed article involving boat loads of migrants drowning in the Mediterranean. By and large these stories refer to migrants attempting to sail from Libya to either Italy or Malta and suffering terrible consequences, drownings from capsized boats, dehydration, vessels rammed and tipped over, people being forcibly returned to the Libyan authorities. So what exactly is going on here? Who are the principal actors? And who are the people who seem to risk everything to get to Europe? The route from Libya to Europe is referred to as ‘the Central Route’ by Frontex, the European Union’s central organisation responsible for intelligence and joint operations on the borders of the member states. Data collected by Frontex since 2008 reveals a striking picture of the results of numerous deals and interventions by players as diverse as NATO, Italy, the EU Commission and Libya’s National Transition Council. Libya and the Central Route are considered a major source of illegal migration into the EU. Since 2008 Libya has seen Gadaffi be overthrown and deposed by a revolution which has desecended into a civil war – with militias taking over responsibility for various government departments, including immigration and asylum. With neighbours caught in internal repressions and conflicts (Eritrea, Somalia, South Sudan), and an increasingly xenophobic EU demanding the prevention of migrants using boats to cross the Mediterranean, Libya has become a hell on earth for refugees. Back in 2007/8, the Central Route saw a sharp rise in the number of illegal crossings. 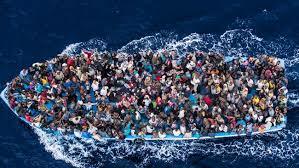 Frontex figures reveal that in 2008, approximately 40,000 migrants were recorded making the crossing. Such numbers prompted the Italian government to push for a bilateral agreement with Libya and Colonel Gadaffi, in an attempt to slow the movements. This agreement saw Libya using highly repressive actions to stop migrants leaving in boats, and Italy paid for a new militaristic infrastructure to identify, detain and deport migrants attempting to cross into Italy. Frontex figures show the success of this agreement, with 11,000 making the journey in 2009 and only 4,500 recorded in 2010. However, with the advent of the Arab Spring and the rebellion against Gadaffi in 2011, a space was opened up for migrants escaping the Horn of Africa and North African regimes such as Tunisia to cross the Mediterranean. With internal conflict and the forcible expulsion of sub-Saharan Africans the figures show that a staggering 64,300 people crossed that year. With the border regime in Libya in turmoil and increasing numbers making the crossing Italy again responded. 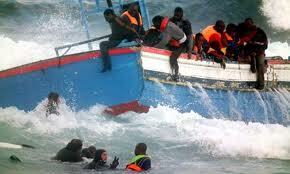 In 2012 the National Transition Council (NTC) in Libya made a deal with Italy to prevent boats leaving. It also allowed the Italian coastguard and Navy to patrol the waters, push back any identified vessels and hand them over to the NTC authorities. This action was a flagrant breach of several acts to protect human rights, including the EU Human Rights act and the Geneva Convention on Refugees. An EU judge ruled that any vessels intercepted by Italian authorities were under the protection of the Italian government and as such deserved their rights as potential asylum seekers. Italy also signed an agreement with Tunisia to return the majority of the Tunisian migrants. Even so, these illegal actions were highly effective, and figures for recorded crossings dropped to 15,900 in 2012. Also implicated in these illegal actions were NATO warships and vessels. Goldmiths University produced a report using sophisticated oceanography technology and claimed that NATO vessels had spotted several distressed boats of migrants and refused to help, and in some cases pushed them back. Survivors reported NATO helicopters and boats observing them for hours without offering assistance. In the past year Libya has seen a tremendous upsurge in violence and internal repression. Refugees and migrants are treated with an appalling lack of respect. Human Rights Watch and Amnesty have made several reports outlining the degrading and brutal treatment of detainees in Libyan detention facilities. Torture, sexual assaults, whippings, refusal of medical treatment, lack of access to legal infrastructure and other violations have been outlined here and here. Libya remains a nexus for migration, due to its geographical location and existing trafficking networks. In 2013 the greatest upsurge of demographics were in the Syrian refugee population which increased by 8,699% from the previous year to 9,591 recorded crossings. Also highly visible were Eritrean and Somali populations. With no end to the militia based conflict inside the country, refugees remain trapped between the need to escape their home countries, earn some money working in Libya and then attempting to leave via a boat. Despite the whipping up of anti-immigrant sentiment in the UK, which portrays all asylum seekers and refugees as opportunistic parasites coming to claim hard working cash from British people, the people crossing the Mediterranean come from a few specific countries. By and large the Eritran, Somali and Syrian populations are currently highly represented. This is not surprising given that Somalia is a failed state gripped by warfare, Syria is in the midst of an endless civil war, and Eritrea may qualify as one the most brutal dictatorships in the world (Eritrea is such a closed regime even the Minister for Information fled the country in 2013 as a refugee!). It makes a mockery of the aspersion that these people know the ins and outs of the UK benefit system. The situation that these refugees find themselves in, crossing in small wooden boats – overcrowded and under-stocked with fuel, food and water, is not a natural or inevitable one. It is one of design, created by specific pieces of legislation. The implementation of lethal border regimes forces this journey on people and so must bear the responsibility of the deaths, which are fast becoming a daily occurrence. It’s time we recognised that the consequences of Europe’s borders are not statistics, but real human misery and death. Changing this would require political courage and a strong demand from civil society not to tolerate this situation in our name or in the name of our security.